Boise State finished the season undefeated with an impressive-looking victory over also-undefeated TCU. And season-long-favorites Florida looked like #1 crushing an undefeated Cincinnati. Either of those teams has a legitimate right to demand an asterisk. But I'd like to imagine a world in which we had been treated to a month of playoff-level excitement. A world where we had gotten to see 16 of the season's top-ranked college football teams battle for the ultimate, indisputable title. Here is what it might have looked like. I have bracketed and seeded the teams according to their final regular-season BCS rankings, with some consideration given to tradition (e.g., Pac 10 and Big Ten champions in the Rose Bowl bracket) and geography. I also used the rule of no more than one team per conference in any given bracket. Rose Bowl: Ohio State over TCU. The Buckeyes looked great in their real-world Rose Bowl victory over the Ducks, while the Horned Frogs looked dismal in their real-world Fiesta Bowl loss. I expect a match-up between the two would have produced similar results. 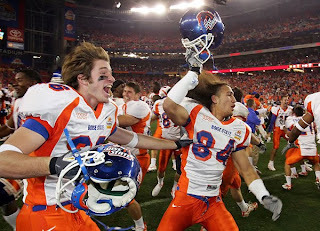 Fiesta Bowl: Texas over Boise State. I think the Broncos would have played admirably and kept it a lot closer than most people think, but I have to believe the Longhorns would prevail in the end. Sugar Bowl: Alabama over Iowa. The Hawkeyes looked solid in their real-world Orange Bowl victory over the Yellow Jackets, but the Crimson Tide would have probably poked holes in them. Orange Bowl: Florida over Penn State. Cincinnati looked overwhelmed against Florida. Joe Pa's leadership could have lead the Nittany Lions to an upset victory over the Bearcats, but they would have looked just as overwhelmed against the Gators. Eastern Semifinal: Alabama over Florida. The Crimson Tide won the teams' first match-up in the SEC championship game, and while they might not be so lucky in a rematch, that victory was decisive enough for me to give them the nod over the Gators. Western Semifinal: Texas over Ohio State. The Longhorns are clearly the better team, but if the up-and-down Buckeyes were firing on all cylinders, they could make it interesting. National Championship Bowl: Well, we all know the answer to this one. Or do we? If we had actually gotten to see this play out, I wouldn't have been surprised in the least to see a Cinderella Ohio State team battling the mighty Gators in the big game. And who knows, just maybe there's a reason the major conference schools all seem to be scared to play Boise State. Sadly, for this season at least, we'll never know. Admirable effort with the bracketing and projections. Unfortunately, you're beating a dead horse... sigh!